The last thing in the world I want to think about is winter. I am a summer girl through and through. But I am. I couldn't help it after I got my most recent J.Crew Catalog...drool worthy, and list worthy items abound! I stopped and fell in love when I saw this coat. The Symphony Coat. Me loves her. The irrational side of me wants the Poppy Red. The Practical side says go for the Black. And somewhere in between falls the Golden Mustard color. And most of me wants all three! Which do you like? Where did you find your favorite winter coat? My favorite winter coat is from J.Crew! A purple wool coat that I love and wear all the time. I think I would go for the poppy red, it's a gorgeous color and I think goes with anything. Living in Florida makes a new winter coat purchase really low on my list. I have had one of my wool coats since high school (gasp!) but I have decided this year I need a new coat. I personally love the red one! Just a little warning..I bought a red Jcrew jacket 2 years ago..the 1st year was great, but last year the fabric got all pilly, and two buttons fell off...Now I need a new coat.. I think you should get all three since that's a whole in your wardrobe. :) But my favorite is the red. Maybe get a practical color and a fun color. Surprisingly, my favorite coat came from F21. I bought it last year and I'm looking forward to putting it on again this year. I say go for one of the colored ones! 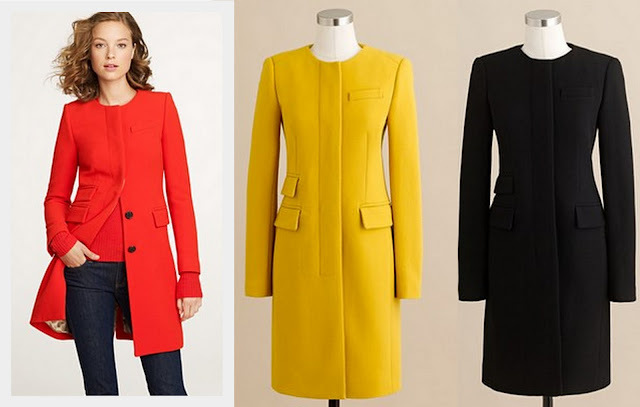 Everyone needs at least one brightly colored coat! Also, the puffy coat is definitely a must, but I really love coats, so I have several others as well that I actually love and that I can wear on most winter days. i was lusting after the coats too! the red is so fab - i might get one myself. and it totally can be versatile..goes with black or brown! Definitely red! I have a bright orange peacoat that I used to wear around Chicago, and yes, it did get grungy after a while, but it was like instant me-branding, plus the color perked me up in the dreary worst of it. I even have a sensible dark gray coat that I almost never wear because the orange one makes me too happy. Oh, that red! I'm absolutely dying; it's so beautiful! get the red! it is going to be so big this fall and winter and it will be an extra pop when you need it! do it. Oh I can totally relate to those brutal winters, from one Chicagoan to another! I like mustard. Nobody wears that color and I <3 being different! Nina Garcia says black coats are boring ;) Because the only thing most people will see is your coat in winter, make sure it's FABULOUS! Get the poppy! Get the mustard! Skip the black! Shame on you for thinking about winter! (lol!) But you are right...those warm/ugly coats are a must...especially in Chicago! I say no to black coat - everyone wear black in winter. I loved the jewelry in J.Crew's new catalog. So much stuff! I haven't found a catalog from them that I've loved that much in a while. You know the black is a classic, but this year you will look amazing in the red as there are so many amazing colours in the Fall palette. I think go for the red! I have a military style winter coat from Reiss that I adore. It has a high neck and gold buttons and I will weep when it wears out, it stood the test of the NY winter when I arrived in Manhattan and I'll wear it again this year too. These coats are so stunning! LOVE them. love em all - id go yellow! There's almost nothing in J Crew's fall line that I don't love! Those coats are no exception.